The State of Qatar is an Unitary constitutional monarchy, covering 11.581 square kilometres in-between the Persian Gulf and Saudi Arabia. It is the home of 2.675.522 citizens, of which 67,7% are Muslims, 13,8% Christians and 3,1% Buddhists. The currency is Riyal, worth 1,71 Danish Krone and €0,23. The GDP is US$185,395 billion. Due to the cities and desert-like conditions, only a few larger mammals are found here: Sand cat, Felis margarita, Golden jackal, Canis aureus, Arabian oryx, Oryx leucoryx and the Arabian gazelle, Gazella arabica. There are 215 common birds in Qatar. There are more than 21 species of lizards, with the most common family being Gekkonidae (9 species). Other common families include Lacertidae (4 species), Agamidae (3 species), Scincidae (2 species), and Varanidae, Sphaerodactylidae, and Trogonophidae with one species each. The horned desert viper, a venomous viper species, has been recorded in the country but is rarely sighted. More than 300 species of wild plants are present in the peninsula, but I will not be searching for any in particular. A short flight from Kuwait, two hour through immigration and car rental, and I'm ready to explore Qatar. The closest is the hotel, which is a nice four star, with pool on the roof. But I head straight to the botanical garden - just in case. It is pretty much across central Doha, the traffic is intense, but rather polite as well. The roads are perfect, here is clean and neat - a nice contrast to Kuwait! Here are a few fancy buildings, and the centre have a fine skyline, but it have nothing extravagance, just a nice and maintained city. The botanical garden is - as usual; a disappointment: It is only open after appointment. I might get one, but it look more like a private company anyway. Half way back, the Omani Market should be interesting, and why not? Well, because of it have been renewed, and it is now a big and fancy super market. Only a few stands with fruits and green are left in the old hall. It is getting too late to drive out of the city, but the Souq Waqif is close bye. I had planned to save it for later, but I don't have that much time in Qatar. Parking is a hassle, and I end half way back at the hotel - literally! The souq is fantastic! It all look like ancient desert buildings, and it is truly worked through. I start with the gold souq, which have creeks and other fancy stuff. Then I head on to the narrow alleys with incense, stuffed animals, mattresses, souvenirs, birds, spices, pottery, tortoises, clothing, waterpibe cafes, antiques, restaurants, food, fruits and much, much more. I find tea and later; dinner, and as the darkness descents, the buildings are delicate up-lighted. I walk around till way too late, but it is worth it. Here are a lot of locals, dressed traditionally, and even a few European tourists, I think. The first I have noticed since Moscow. 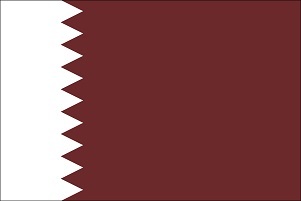 Despite I have a hard time finding what I intended to see, I like Qatar way more than Kuwait! Just as in Oman, the silhouette of the king as young is everywhere, and he seems to be popular. 26. I head north, pretty much through Doha, and then the suburbs. The aim was the 4000 year old Umm Şalāl 'Alī burial mounds, but I can't find them. It was the nature here I came for anyway, and it is here. Like I lean the rest of the day, northern Qatar have pretty much only one type of landscape: Desert with scattered plants. A few low Acacias, salt bushes and not more than ten other species of plants in total - as the annuals are gone by now. Most are gravel, but a few areas have sand and some areas are rocks. A single, little area seems to have received some rain a week ago: Here are plenty of small sproughts. The next sight is the harbour of Al Khor. It is pretty big, and I only see the fishing-part. Here are wooden boats with both nets and creels. I find it a bit strange: A country with no trees at all, use wooden fishing boats these days. A group of fishermen is sitting picking crabs out of their nets - they would have settled for fish, I guess. Next to the harbour is a small fish-market. The guys are desperate to show me their fish and crabs, although it is clear; I only make photos. On the map, I can see a big harbour up north, and while the villages, towns and buildings in general disappears, the eight lane motorway is brilliant - and empty. The last settlement near the road have some truly impressive pigeon towers. Quite some distance before I reach the port, I get this distinct feeling: It is an oil-port, and I'm not welcome at all. And I voluntarily turn around, and find a road heading west towards Al Ruwais. I pass a larger town, and their sports club is impressive. It seem like their station is in the exact form - but bigger - than a desert fort. Then I reach Al Ruwais. It is another fishing port, but not much of a city. First I find out to their beach with palms and tiny snails. A bit on the other side of the settlement is another beach with mangrove. Here are some black areas, and it is cruel oil, dried out to almost rock. Along the main road, a few shops are found, and I get lunch and my mug filled with masala. Then I start the tour down the westcoast. Here are signs showing off to forts and others, although there are not really any roads. I follow a rude track to a ruin village, probably a pearl fishing village. The beach is covered in plastic and oil - quite a different from the almost clean desert. The nearby mangrove suffers the same way, and I head on. The road - and there are not others - follow the coast a bit inland, and after some time, I see a sign to a fort: Al Thaqab. It is a stony desert, and the road is real bad. And quite longer than I had anticipated. I finally make it to a nice looking desert fort, with no information, no people and not the better road to leave by, as I had hoped. When exactly Al Thaqab Fort was built is unsure. Some sources say it dates back to the 17th/18th century but most agree that it was built in the 19th century. I make it back to the smooth and sealed road, hoping the car rental company won't look underneath the car. The area look pretty much like everything else I have driven through today, until I meet the mountains. Well, it are some sandstone formations, but only two or three metres high. I still botanises, but fail to add any new plants to the list. I find Zubara Fort near the coast. Her have been some sort of fortification for thousands of years, but the present is from 1938. Inside is a lot of information on the history for the location, and outside is a Bedouin tent. I follow the road towards the beach, but it is blocked. One part is the excavation of a pearl fishing village, the other some rich peoples huts on the beach. I have to settle with the salt swamp and its special succulent. Then the road turns inland, but without the scenery changes. I see a few scatted camels and a herd of sheep, but here are no settlements at all, except a few remote buildings. Near Dukhan, I turn back towards Doha, sawing the southern Qatar for tomorrow. 27. I head back to Dukhan where I left yesterday. I pass some large herds of camels, but I mainly lookout for some rock formations I spotted yesterday. They are way out in the desert, but I manages to find my way out to them. It is limestone, forming some "mushrooms", and in an else so flat landscape, it is a treat. Here are hardly any settlement, but a few places apparently have wells that can support some nurseries and even Lucerne crops. I do several trips out in the wild, but I fail to find any new plants the entire day. In general, it is a gravel desert, some areas dominated by sand, others by rocks. Only a few places, the limestone form ridges. The central part seems a bit more fertile than the south, but the differences are minute. I reach Dukhan, which I had hoped was an old town. It is a brand new one, build by Qatar Petroleum, and most are sealed-off to strangers. Way before I reach the town, huge sighs warn about not taking photos and videos. And considering my past experiences with having my photos looked through, I actually restrain from making any here. Well, except from the pretty flowers in front of the "souk", the only supermarket. I stock some tiny bananas and biscuits for later, and head south. The road is lined with nicely white-painted pipelines, and the area is pretty neat. Then, 18 kilometres south of town, their company beach make it possible to get out to the water. Here is not really that interesting, but at least, the black stuff is dead seaweed, not oil. They have even bothered to plant some palms. Guess here will be someone in summertime. The oil-land finally ends, and I can explore some more. Slightly disappointing, as I still fail to find any new plants. The most interesting is a sheep herdsman on a donkey. Most camels and sheep seems to be left on their own, but the roads are proper fences. I reach the closed Saudi-border, and the gas station is closed off too. But I spot some activity, and walk in. Here, a very unfortunate Indian opened a coffee house just before the border was closed. None use the road, and the few Bedouins don't buy Indian tea and food. Almost at the south-eastern corner of the country, I spot a massive sand dune out in the rock desert. It is 2-300 metres high, and have all kind of formations on its extensive body. I walk to the top - which take quite an effort, and enjoy the view to the scatted Bedouins. At the base of the dune, the sand is dotted with pink marble. The rocks have been sandblasted, and great formations created. To my surprise, I find a almost perfect fossilised snail in the pink marble, which I thought to be way older than snails? If it hasn't been the size of a fisted hand - and significantly more heavy, I would have brought it back home. I reach the other Saudi-border, and head home. Despite I really try to find something interesting on the way back, I fail, and end up in Doha at four. I walk to the house next door, just to get a picture: The entire building look like a giant C. Then I drive downtown to the harbour, and then the souk. I withdraw some cash, and find a place to eat. One of the locals I talked with the other day, recommends some vegetarian local speciality (forgot the name), and it taste great. I share table with two locals, one teaching IT at the university; Saeed. We have a long chat (and yes, unfortunately, I did most of the talking; bummer), and then I head back to my car. A police officer is placing a yellow sticker on it, and apparently, I was not aloud to park here - in-between the locals. It seems like the fine is 300 riyal - more than I have spend on food and petrol. Bit annoying, but nothing to do. And the officer will not explain how I pay this fine - I guess he is fed up talking to people he fine. Photos of the day: Day 3: The south And as I don't expect to see more plants: Plants of Qatar. 28. A slow start on the day, but I have seen what I came to see, and from midnight, I will be travelling for more than 26 hours in a row. I park at the harbour, and do a walk around. The wooden dhows look great, and I believe most are a kind of summer-houses for their owners. Then I find back in the souq at lunchtime. I find a little Indian place, way-back, offering a fantastic authentic (Indian) dinner for next to nothing. Then I start walking around the nice and interesting souq, meeting familiar faces and find some new angles. In one area, everything is Falcon-something. Even the post and rather big hospital! I think - with a giggle - "then the falcons can go to the hospital too". And yes, that is exactly what they can. The shops have huts, straps, gloves and of cause the birds for sale. Next to this area is the little, old fortress. One of my goals for the day is to enjoy a lot of masala/Chai/milk-tea. And not at the posh places in the main streets. I find a little cosy restaurant in the back, which turns out to be Yemeni. They show nature film on a TV, and I must go there some day! But they agree, it is not safe enough yet. I get the tea for free, and head on in the slightly sleepy souq. At half pass two, at prayer-time, most shops closes, but I get some tea, and enjoy the sun. The pet street is still open, and so are many of the shops in the main alleys. I passes the huge stables, but the horses are apparently at brake too. The old farts, driving the wheel-barrows have their brake for sure; The wheel-barrows stand in groups all over the place. I have some longer conversations with some of the shop keepers. Some are from Yemen, others from Syria, Egypt and so on. Commend is that they seem so happy and content. Most of the Indians I have meet in Qatar seems to originate from Kerala, and all praise its beauty. I have to go there one day too - although it most be vacant. At dusk, it is all up running again, and even more street vendors turn up. Here are entertainment at the larger squares, and a lot of people. I get a great fatah dates-dinner at the Yemeni restaurant, and then get the car and drive to the airport. I have seven hours to the flight, but I will work five hours anyway, as I use to Day 4: Back in the Souq.